After walking the new Landfill Loop trail that opened earlier this morning, I walked east on Parr Blvd. to Richmond Parkway. (Parr Blvd. is a dotted line running east-west on Bay Trail map shown, and is not part of Bay Trail.) I first walked south on Richmond Parkway to Wildcat Creek Regional Park, and then north as far as Goodrick Ave. (toward Point Pinole). This stretch of Richmond Parkway had a wide bike/pedestrian path or sidewalk, and this made walking near a road with fairly heavy car traffic quite pleasant. Part of the road (from the WCCC landfill area to Wildcat Creek) even had some tree shade along the way. As mentioned in the previous post, I hope to be walking the connector trail (dotted line running north-south) between the West County Landfill Loop and Wildcat Creek Regional Park next year, after this 1+ mile trail opens. This would add another mile to what is already a sizable trail base in Richmond. 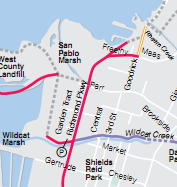 Approximately 30 miles, or 10% of the total number of miles of the San Francisco Bay Trail, are in Richmond. Unfortunately, I had taken so many pictures of the Landfill Loop trail opening that I ran out of (camera) memory, and so I did not have my camera with me on this walk. As in the past, walking without a camera almost always guarantees that there will be a few great prize-winning shots (in my mind at least) that I will miss -- like today's white-tailed kite (bird) flutter-hovering about a brightly colored grass and flower-filled field and then sitting nearby in a tree, and a gorgeous view of Mt. Tamalpais with lots of colorful flowers in the foreground. Ah well. I have only a few iPhone pictures of this walk, and none of the kite (bird).